The upregulation mechanism of histamine H1 receptor through the activation of protein kinase C-δ (PKCδ) and the receptor gene expression was discovered. Levels of histamine H1 receptor mRNA and IL-4 mRNA in nasal mucosa were elevated by the provocation of nasal hypersensitivity model rats. Pretreatment with antihistamines suppressed the elevation of mRNA levels. Scores of nasal symptoms were correlatively alleviated to the suppression level of mRNAs above. A correlation between scores of nasal symptoms and levels of histamine H1 receptor mRNA in the nasal mucosa was observed in patients with pollinosis. Both scores of nasal symptoms and the level of histamine H1 receptor mRNA were improved by prophylactic treatment of antihistamines. Similar to the antihistamines, pretreatment with antiallergic natural medicines showed alleviation of nasal symptoms with correlative suppression of gene expression in nasal hypersensitivity model rats through the suppression of PKCδ. 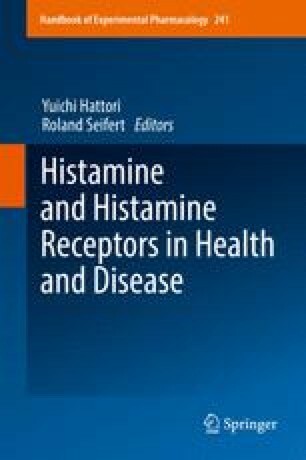 Similar effects of antihistamines and antiallergic natural medicines support that histamine H1 receptor-mediated activation of histamine H1 receptor gene expression is an important signaling pathway for the symptoms of allergic diseases. Antihistamines with inverse agonist activity showed the suppression of constitutive histamine H1 receptor gene expression, suggesting the advantage of therapeutic effect.